Through our module you’ll be able to increase your conversion rate by up to 30% as a consequence of 2 combined actions. 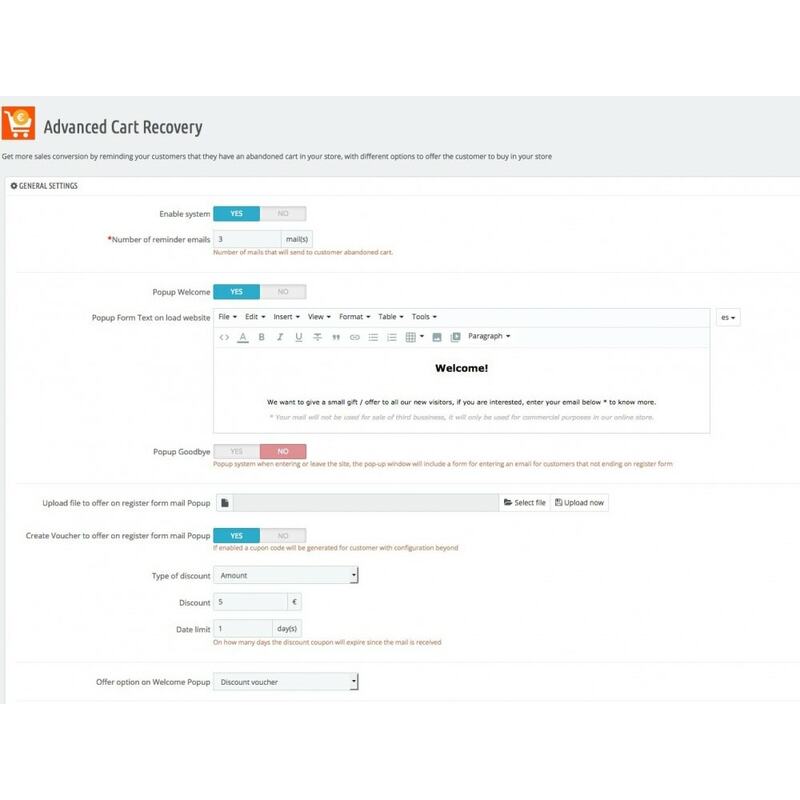 The cart recovery modules are only available for clients previously registered on the website. If a user is browsing your electronic business and adds a product to the cart, then goes to the payment page but finally decides not to register, you won’t be able to take any actions since you don’t have any data for that user. Our module solves this situation and allows you to recover many more abandoned carts. An increase in the email addresses of clients that for some reason have quit the purchasing process. Most users are interested in good quality extra content or discounted products and so a large number will decide to register their email address. This way you can now monitor their visit through the site and if they eventually quit the process, you will subsequently be able to remind them that they have an abandoned cart and encourage them to finalise the purchase at a discount. Increase the conversion rate of your online shop by up to 30%. Add a pop-up window with quality content that appears whenever the user accesses your online business and that requires them to register their email in order to download the information. Add a pop-up window showing an interesting offer or discount whenever the user is about to leave your online business, this way you can keep them and make them register their email address. Helps recover abandoned carts through a simple configuration where you can add the number of emails you wish to send and when to send them. 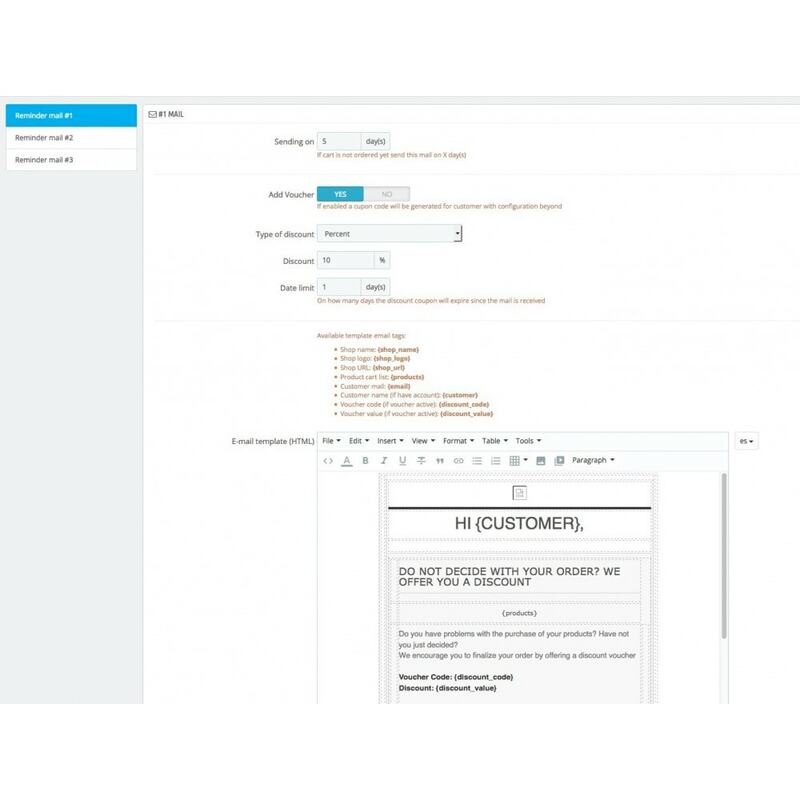 You will also be able to modify the email template sent to the client that has abandoned the cart and add an automatically-generated offer exclusive to that client. Substantially improves the sales of your online shop as you are able to recover more abandoned carts. Increase of client contact details for future communication, promotions, discounts, novelties, etc. Allows you to foster the loyalty of more clients.